I’ve been very conscious lately about not adding too many pieces to my wardrobe, instead trying to restyle trusted pieces with a few key buys, whether that’s trends or just common sense additions for the autumnal months, so I thought I’d share with you the three key pieces that I think would look good in any wardrobe, especially if you are working on a capsule wardrobe like me. Basically, these are three autumnal pieces that will be very versatile for the coming months, as well as into winter. I love, love, love a statement knit. 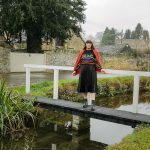 I generally don’t think you can have too many jumpers, they are great to wear with jeans, skirts, over dresses as well as layered over shirts and even layered under cardigans, like I have done here. 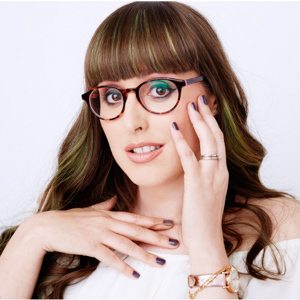 For me, this autumn, there are a few things I’m looking for when buying a statement knit – it has to be something bold, whether that’s a rainbow stripe, which is so on-trend, a vibrant block colour like red or orange, or have a cool slogan, as I do love a slogan. 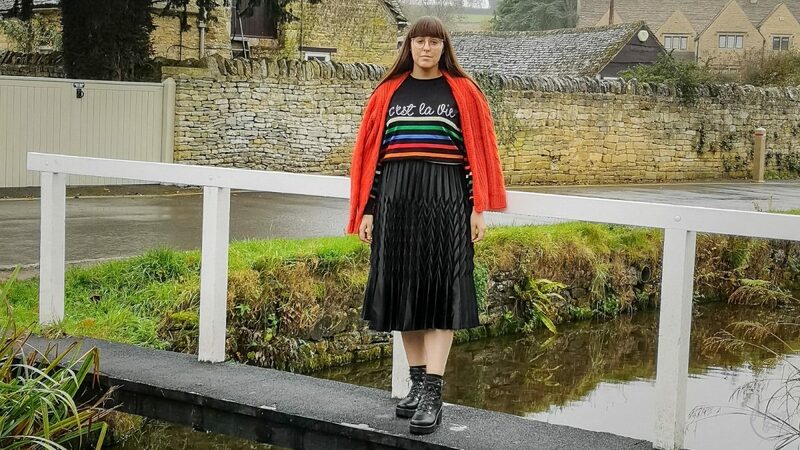 This New Look ‘c’est la vie’ slogan jumper, ticks more than one box for me, it has the quirky slogan, added bonus that it is in a fun handwritten style, it has the rainbow stripe, plus it is black, means it will be very versatile. It will look as good dressed up with this skirt as it will with black straight leg jeans and biker boots, and I can’t wait to style it up. 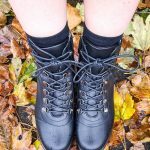 I’m a huge boots fan, especially in the autumn, and I’m so happy about the hiking boot trend that hit the catwalks of Gucci, Louis Vuitton and Proenza Schouler, as not only are these the autumnal answer to the summer ugly sneaker trend, but they are functional and so comfortable to wear. 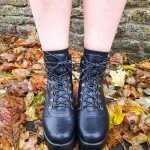 Things to consider with this utilitarian style, chunkier the better, use the hiking boots to toughen up your look, like I have with my high-shine pleated skirt, or how about a floral slip dress or a soft jumper dress for a full-on casual look. Want to soften up your hiking boots change out your laces for ribbon for a fun and quirky look. 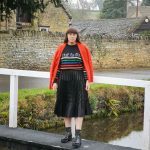 One of my favourite trends this autumn has to be high-shine, whether you fancy patent or a satin shimmer there are so many options, and I found this beauty of a skirt on Quiz, my go to place for going out dresses, and I was obsessed. Not only does it shimmer perfectly, whether worn casually for a day in the Cotswolds or a night on the town, but it has a beautiful zig-zag design to the pleated skirt that really adds an extra dimension to the satin midi that I just adore. Shiny materials can be a little scary, they cling in all the wrong places, but find a style that you like, such as a pleated midi and you can make the trend work for you, and this skirt will definitely be one I wear in years to come. Dress it up with sequins and strappy heels, or dress for winter with knitted tights, or even layer under a sheer tulle dress for a truly magical textural affair. The styling possibilities are endless – but I do think it will make a great alternative to wearing a dress to the Christmas party. What pieces are you adding to your autumn wardrobe?